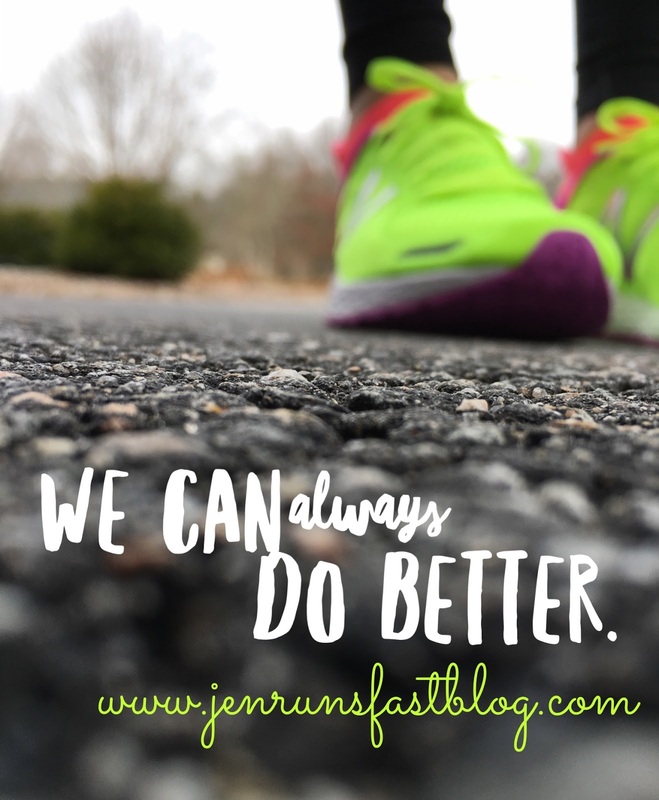 Run Jen Run: We can always do better. One thing I’ve learned as a runner and as a coach is that we can always do better. Whether you’re a beginner and just crossed the finish line of your first 5k or you’re an elite that just qualified for the Trials, we all can do better—and that’s the beauty of this sport. There is always something to keep us pushing forward. It’s a sport where anyone can participate. We all endure the same highs and lowest of the lows no matter how fast or how slow of a runner you are. It’s a sport that brings us the greatest sense of accomplishment and then not long after can break your heart. Sometimes it all comes down to how bad do you want it? How hard are you willing to work in training and how hard are you willing to fight for it in a race? And is it ever enough? Are we ever truly satisfied? Does an elite runner stop running when he or she breaks the World Record? Heck no! They get right back to work because they want to break it again and raise the bar even higher. If your race didn’t go to plan, many runners including myself tend to over analyze. Where did I do wrong in the race? What are the factors that I cannot control? What could I have done differently in training? On the other hand, when a runner hits their goal and runs the race they wanted to run we still over analyze because like I said we can always do better. Trainer harder. Race bolder. Recover smarter. Eat healthier. Sleep more. Stretch. Strength train. Cross train. As I continue to push forward to make myself the best runner I can be, I ask myself—is it all worth it? Absolutely. So keep running, my friends. On that perfect day when everything lines up and comes together, I believe something magical is bound to happen. I signed up for Rock 'n' Roll Philadelphia!